Is it time to upgrade your current wood-burning fireplace to a natural gas fueled fireplace? The ease of natural gas adds a lot of advantages. You can enjoy a full fire with dancing flames and glowing embers without the work of lighting kindling and keeping up a wood supply. This Tahoe model features a 36-inch face that will coordinate with just about any type of living area decor. The fire is lit by an intermittent pilot ignition and can produce up to 20,000 BTUs of heat. When the weather turns cool, that heat can be circulated through your living area and keep you and your family warm. Does the surrounding mantle come as part of this fireplace unit? The mantel is not included with this fireplace. Is this fireplace complete or sold in separate parts? 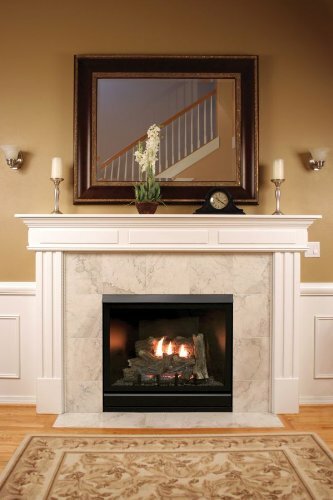 This fireplace does require at least two other separately-purchased items: a barrier screen and a vent kit. Both items are shown on this page. What is the UL number for this product? The UL file number is MH30033 and this is tested to ANSI Z21.88/CSA 2.33 as a Direct Vent Gas Fireplace Heater.